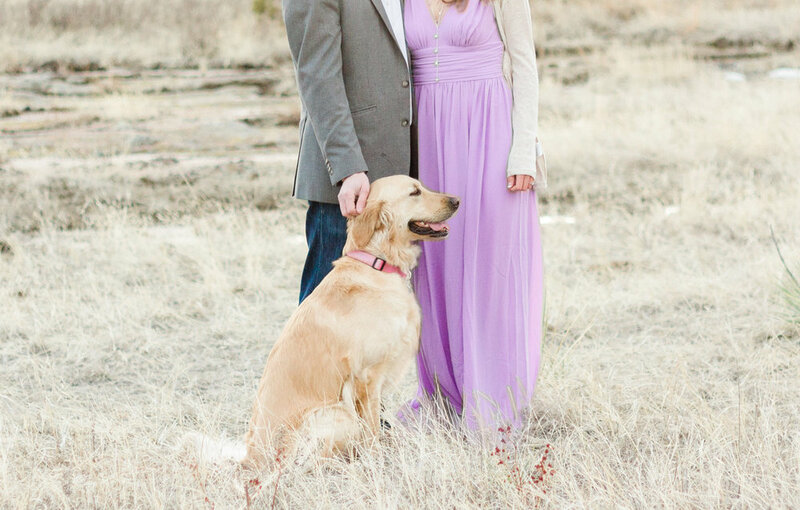 I recently had the privilege of spending an evening with David and Julie and their precious Golden, Nala. It was definitely a little chilly and breezy but we could tell that spring is in the air! I love engagement sessions when the weather is slowly beginning to warm up and you can almost feel the summer warmth on your shoulders! Engagement sessions are one of the best times to get to know couples better and let me tell you, I enjoyed every minute of Julie and David’s session! It was a great opportunity to learn more about them and their love story- and I can also tell you that Nala enjoyed herself too! It was so fun to watch her run wild and relish in her freedom. What dog wouldn’t love that?! One of my favorite moments during David and Julie’s session was seeing how David looked at Julie- he is so smitten with her, it’s just the sweetest thing I’ve ever seen! Julie is just so beautiful and I absolutely loved her dress.. perfectly flowy and the perfect color for spring! This precious couple will be saying their vows in September in Beaver Creek and it will be a day to remember, I can guarantee that much! Amazing Colorado views combined with these two adorable people will make for a gorgeous day!